The uCloud system created by Ucom has been turned into a separate portal, which will allow users to reduce costs for the implementation, maintenance and development of an IT infrastructure. uCloud's ucloudspace.am portal enables start-ups and large companies to have different types of separate virtual servers, various cloud applications and other cloud solutions. On uCloudspace.am portal users can get familiarised with the services provided, register online, perform online payments and manage services through one interface. Via this portal Ucom offers IaaS (Infrastructure as a Service) service, which allows creating virtual servers on uCloud interface, use various operating systems and build own network infrastructure. 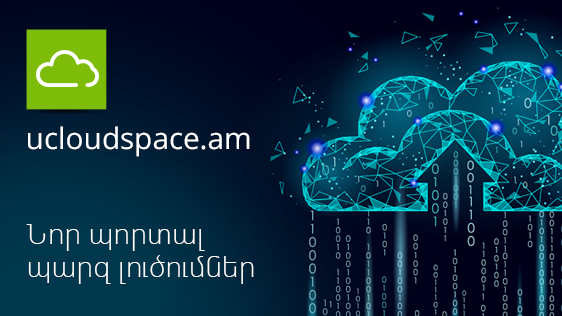 Unlike a number of Armenian companies, which provide only virtual servers, uCloud enables to create a fully independent environment, where one can use and manage different products at a time. "In the near future we will develop our ready-made platforms (PaaS) and software services (SaaS). Currently the portal also enables to register domains, use shared hosting service, in particular, create web sites and put them on online servers. We also offer collocation or physical hosting service, which involves installation of client's equipment in our data center," said Hayk Yesayan the Co-founder and Director General at Ucom. It should be added that 24/7 online support service is available on ucloudspace.am portal.